I spent a few days over the past week working on a little project that’s been bouncing around in my head lately. I’ve wanted something like this to exist for years and with the skills I’ve obtained from Treehouse over the past several months, I thought it was finally time to build it myself. Today, I’d like to announce #OpenWeb. The site aggregates headlines from independent publishers that focus on Apple products and software. It also serves as a directory of single-person weblogs within our community. Over the past few years, social networks have become less and less exciting to use and there have been some subtle indications that the open web is poised for a comeback. With Micro.blog, JSON Feed, the meteoric rise in podcasting, and the frustration that many of us have had with Twitter and Facebook — I think weblogs could be the next big thing. Writing on the web has always been a passion of mine. From the moment I hit publish on my first Blogger site in my junior year of high school, I knew this was something I was going to do for the rest of my life. There’s nothing else in the world that helps me digest and formulate my ideas like writing. And the ability to receive instantaneous feedback from readers is just incredible. I think everyone should have a weblog. But discovery is still a major problem. Why would you put the effort into buying a domain, setting up a site, and writing if no one is going to read it? And if you do manage to jump through all the hoops to start publishing, how do you find others in the community that have done so as well? #OpenWeb let’s you find out what everyone’s talking about without having to wade through dozens of knee-jerk political reactions on Twitter or inspirational memes on Facebook. Those things have their place, but I think we need somewhere to go for more thoughtful commentary. But this site isn’t just a collection of headlines. 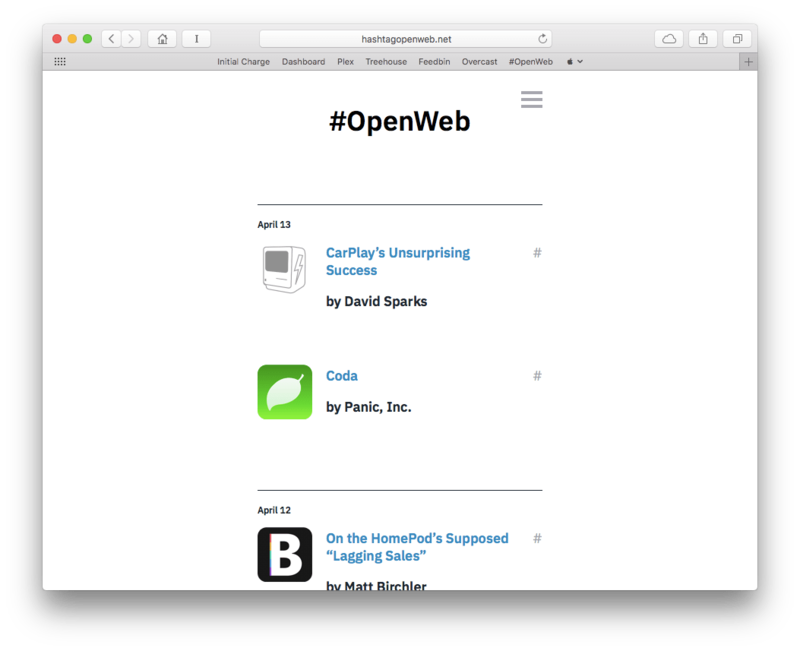 #OpenWeb’s sources page lists every weblog that feeds the site, alongside the author’s name, and prominently displays a link to an OPML file, which includes all of the RSS feeds. I want to showcase the writers that make #OpenWeb possible and encourage visitors to read these sites in whatever RSS reader they prefer. And #OpenWeb isn’t finished yet. In the short term, I’ll be focusing on adding new sites to the sources list — if you know of one that might be a good fit, I’d love to hear your suggestions. But in the long term, I plan to modify the design to look better on larger screens and investigate new methods of aggregating the headlines. At the moment, I’m using IFTTT triggers for each site, which isn’t exactly ideal. I’d also like some feedback about the design and what I could add to the site going forward — aside from the aforementioned addition of new weblogs, of course. This is only the second web design project that I’ve done entirely on my own — the current Initial Charge design being the first — and I’d love to hear what others have to say about it. Good, bad, or otherwise, just at me on Twitter.